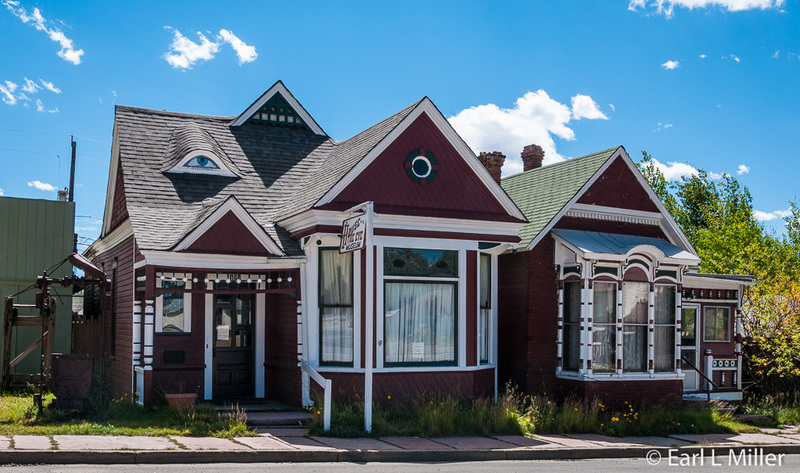 Although mining history has been a critical part of Leadville’s past, understanding this city’s residents and their lifestyles can prove just as interesting. To find out more, visit the following attractions: The Heritage Museum, The House with the Eye, and Temple Israel. All provide you with detailed background about life in Leadville. 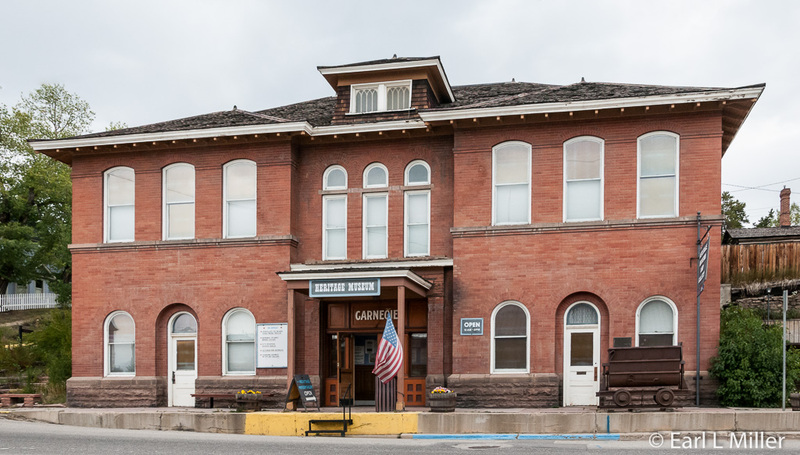 Since 1971, Leadville’s Heritage Museum has been housed in the city’s former 1904 Carnegie Library. Its displays focus on the city’s founding and early history. In fact, the only 20th century exhibits I saw were on Camp Hale and the Climax Mine. I did find the displays static, with many behind glass. Some lacked in artifacts and information, but they do give an overview of what Victorian life was like in this small city. The largest room on the first floor concentrates on Leadville’s mining history. 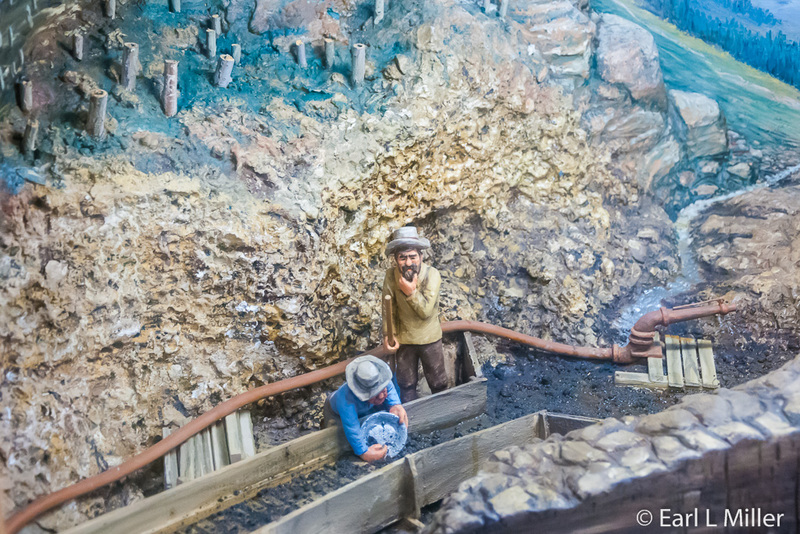 You’ll see some Hank Gentch dioramas, of which there is a roomful at the National Museum of Mining. Those familiar with Tabor and Leadville’s early history will find it the exhibits a refresher course. We did learn some new facts. Most area mines had 50 ounces of silver to a ton while those on Fryer Hill (location of the Matchless, Little Pittsburg, Robert E. Lee, and Crysolite Mines) had 100 to 1000 ounces of silver to a ton. Lake County, of which Leadville is a part, had more than 30,000 mining claims. Since the county was part of the Kansas Territory, anyone who wanted to file a claim had to go to Kansas City, a distance of 700 miles. In 1878, when Leadville became incorporated, town lots sold for $25 each. By the summer of 1879, the cost had risen to $5000 per lot. After the 1893 Silver Panic, a lot of the real estate lost much of its value. When finished with this “Mining” room, head to the building’s east side featuring Victorian furniture. 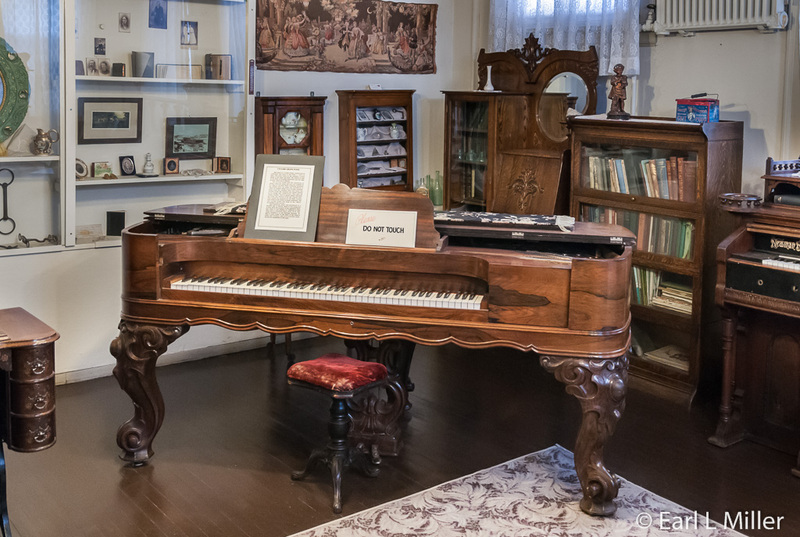 It contains a brass bed, Norman Brothers organ, antique sewing machines, and Baby Doe’s piano. It also has a collection of household items and vintage clothing. One of the best exhibits is on the landing between the two floors. 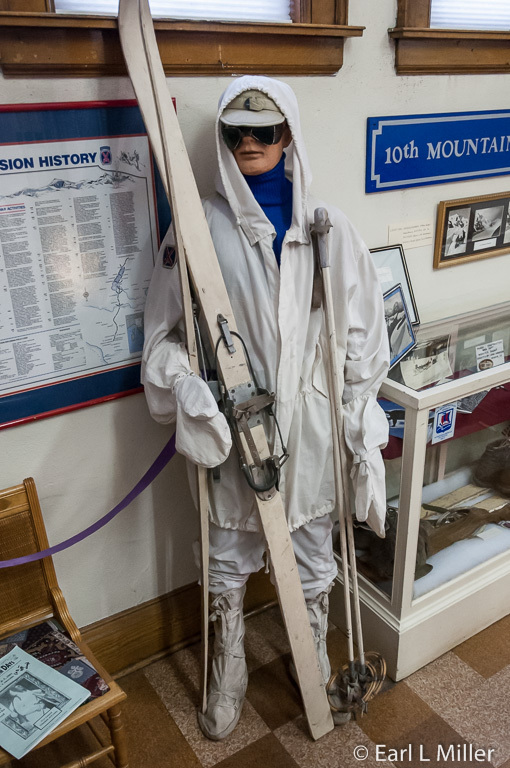 It’s on the 10th Mountain Division memorabilia from Camp Hale. The display has some of their gear, a winter coat, and a snow uniform. In 1941, Minnie Dole, the founder of the National Ski Patrol, convinced the United States Army of the need to train World War II troops on winter survival, mountain climbing, Alpine and Nordic skiing and various weapons and ordinance. Camp Hale, 17 miles north of Leadville, was the site selected. The camp accommodated 15,000 men, 200 K-9 units, and 5,000 mules. The Women’s Army Corps stationed 200 women there to handle communications, the motor pool, munitions, and other noncombat duties. After two years of training, in 1945, the Army ordered this division to Italy. They spearheaded a number of actions. They breached the Gothic Line in the Apennines and secured the Po River Valley which played a major role in northeast Italy’s liberation. When the Germans surrendered in May 1945, 992 ski troopers had lost their lives and another 4,000 been wounded, the highest casualty rate of any U.S. division in the Mediterranean. After Camp Hale was decommissioned in 1945, some of the soldiers returned to create Colorado’s ski programs. The 10th Division is currently based at Fort Drum, New York. 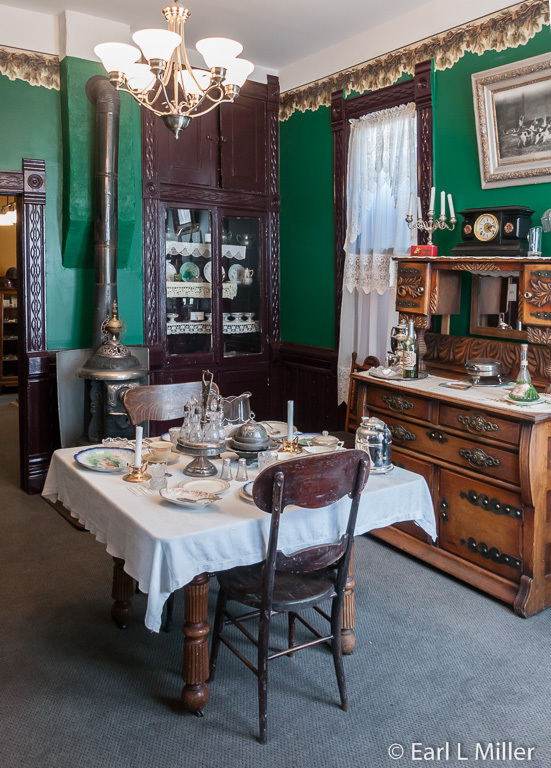 On the second floor, you’ll find one room houses the 19th century everyday items that you could buy in stores such as groceries, clothing, and pharmaceuticals. It’s hard to believe that cotton hankies went for four to six cents and shirts from 25 cents to $2.50. But they did. Drugs used in Victorian times were commonly liquid cures which supposedly treated everything. This section also had displays on the railroads, bars, schools, and theaters. The day that the Tabor Opera House opened had been highly celebrated. Unfortunately, town vigilantes conducted two hangings that evening which drew more people than the theater’s first attendance. In this area, I was especially attracted to the mock-up of the scale model of the 1895/1896 Crystal Ice Palace. The palace was the largest ice structure ever built in the United States. It was constructed to counter the effect on the economy of falling silver prices, create jobs, and draw sightseers. Local businessmen financed it. It included a carousel, skating rink, curling rink, toboggan runs, a theater, and enterprises for gambling, dining, and dancing. Unfortunately, no one predicted an early thaw which shut down the Crystal Palace prematurely. 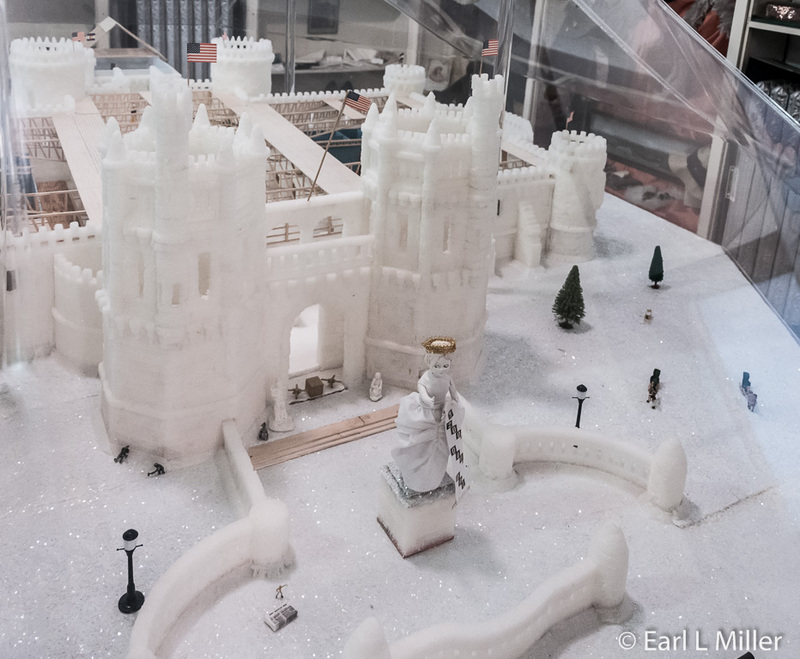 You can see another model of the ice palace at the National Mining Museum and Hall of Fame. It was designed by Charles E. Jay, the architect who designed an ice palace in St. Paul, Minnesota. Construction, taking just 36 days, commenced on November 1, 1895 with a crew of 250 men. It was more than 58,000 square feet and used 180,000 board feet of lumber and 5,000 tons of ice. It had an extensive framework and used ice for appearance only. The palace covered 5 acres of ground. Electric lights shone through the castle’s translucent walls. Search lights, with prismatic colors, decorated the outside. After seeing the model, visit the last room on this floor. It’s also eclectic. It ranges from dolls and more clothing including children’s white outfits to Victorian scrapbooks. The highlights were the photos of the Molly Brown and Tabor weddings and a newspaper article reporting Baby Doe’s death. It also had an assay office mockup and exhibit on Boom Days history, Leadville’s big festival each summer. The Heritage Museum is located at 102 E. 9th Street. Its telephone number is (719) 486-1878. It’s open mid May through late September from 10:00 a.m. to 5:00 p.m. Admission is $6 for adults; $3 for ages 3-16. Head for West 4th Street, to find The House With the Eye, one of four adjacent structures on Millionaires Row constructed in 1879 by E. Robitaille, a Quebec master architect and carpenter. He designed the house with clapboard siding and a swept dormer. In the roof of a cupola, he placed the eye from Colorado's state seal in a stained glass window. During Victorian times, architects designed stained glass, roofline windows in the front of homes depicting such themes as miners’ tools. Robitaille had strong religious beliefs and patterned his window after the All-Seeing Eye of God. The current eye, on the front of the house, is a replica installed in 2014. The original had a broken piece. The replacement glass for the pupil is 100-year-old glass from a Whittier, North Carolina church, the same kind of glass that was part of the first one. The blue and pink glass from Pennsylvania and the purple, Kokomo glass from Indiana, are possibly the same antique glass as in the first eye. The original eye is on display inside the home. Robitaille and his wife lived in the house for 1-1/2 years before moving next door to the small home that looks like an annex. The House with the Eye was then used as an office and model home. Mrs. Robitaille was a milliner who created hats and dresses. The two story home next to The House with the Eye had fashion shows on the bottom floor and fittings on the top level. The fourth home is now a vacant lot. Mary B. Cassidy, a local newspaper reporter, operated, alongside her husband, George, The House with the Eye Museum for 23 years before it closed after her death in 1987. Her daughter, Barbara Bost, reopened the property in 2011 after contractors did extensive reconstructive and design work. Neil Reynolds, museum operator, was instrumental is overseeing the restoration of all the original hand-carved, pine woodwork. He pointed out to us that it consists of different patterns in every room. He also arranged the antique furnishings and accessories (none of which were original to the Robitailles) and selected color schemes for the different rooms. Besides this job, Reynolds is a private attorney, municipal court judge, and fifth-generation Leadville resident, whose passion is protecting the town’s history. He also serves as the operator of the Tabor House Museum. He joked with us that he was a judge in the highest court of the land. His court is higher in elevation than Leadville’s district court. Leadville is 10,152 feet above sea level. 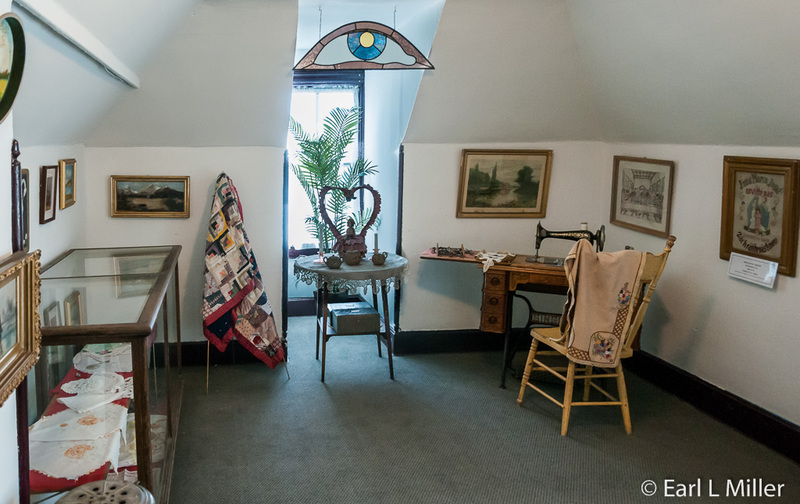 The House with the Eye is not a house museum but is instead a museum with collections donated by local residents found in every room. In the Music Room, ladies used to sew and play cards. It contains an 1878 organ, brought over Mosquito Pass; a circa-1925 electric player piano; and a pump-type player piano. A “big horn” Victrola is also on display. In the dining room, couples met for the evening meal, with no children, which is why the table is set for only two people. The built-in china cabinet is very unusual. Upstairs are the housekeeper’s room, nursery, and master bedroom which contains period clothing. 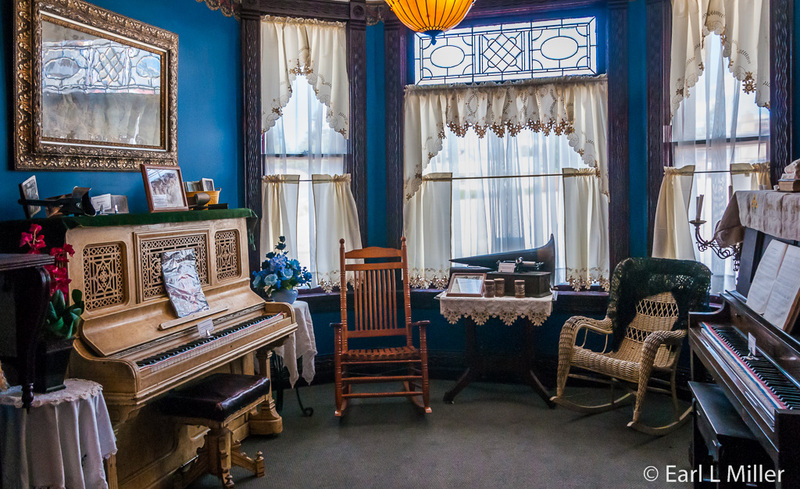 Be sure to check this room, and others throughout the house, for the efforts of the Victorian ladies who lived here. They studied sewing and painting, and their works are on display. The kitchen had indoor plumbing, unusual for those times, a regular range, and the original porcelain sink. It was David Buick, founder of the Buick Motor Company, who invented the process to bind porcelain to metal. He sold the process to his partner for $6500. In this room, we also saw a 1910 cordless vacuum cleaner. It didn’t sell because the user had to pump it. The garage houses a huge bottle collection. When the Robitaille’s lived here, the garage was a backyard. Note the 1890's, ornate, grey, Studebaker horse-drawn hearse. It was reserved for the funerals of women and young people. This gray hearse was drawn by four mated grey horses. Protocol demanded black hearses carried men only, while a small, white hearse, pulled by a pony, was used for infants. The gentlemen’s smoking room has been set aside to show the tools that miners used. Before the National Mining Museum, this room and the Matchless Mine were the only places in town that displayed mining artifacts. On display are such items as an old steam pump used to dewater mines; the first air-drilling machine to extricate the ore; and hand drills and hammers. 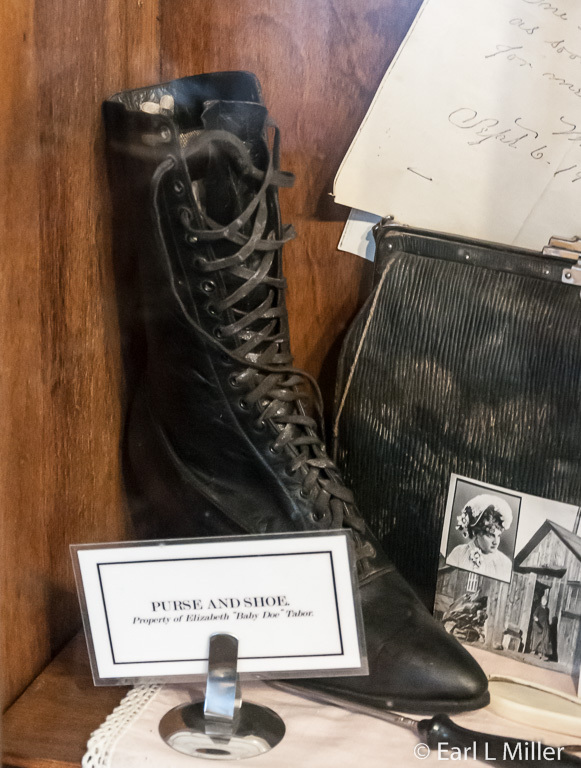 You can also see the nooses for the three legal hangings which occurred in Leadville, a scale from the Matchless Mine, and Baby Doe’s purse and her high-topped, lace-up, black-leather shoe. Among the other artifacts are a Prohibition-era still, a candelabra made from World War I brass shell casings, and a 1904 Edison’s Rotary Mimeograph machine. The House with the Eye is located at 127 West Fourth Street. This museum’s phone number is (719) 486-0860. It is open during the summer from 10:00 a.m. to 4:00 p.m. and during the rest of the year by appointment. Admission is $3 for children, $4 for seniors, and $5 for adults. Who would expect that the oldest temple west of the Mississippi River would be in Leadville, Colorado? 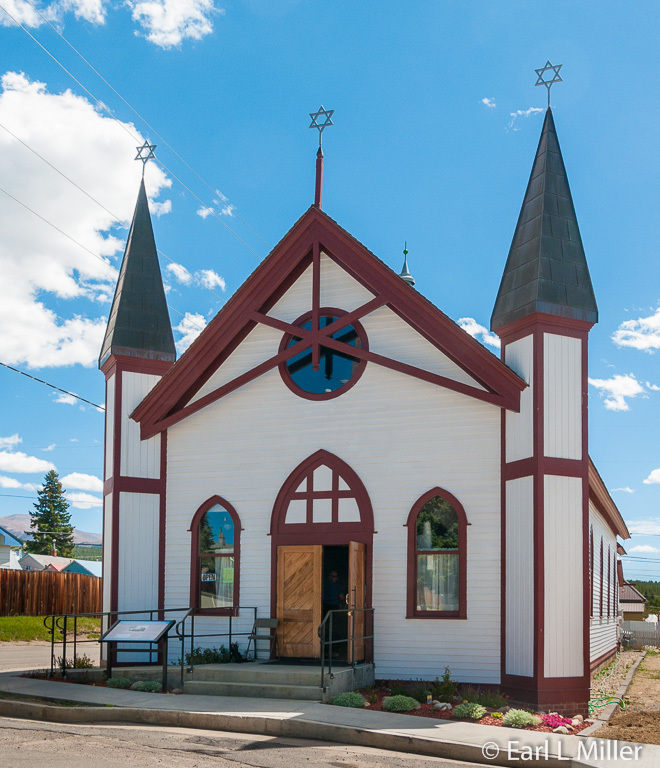 Constructed in 1884, Temple Israel served the needs of the 300 Jews when Leadville had a population of 30,000. They migrated to the area for the same reasons others did - a sense of adventure, to improve their social and economic status, and to reinvent themselves. Some of these were well known such as Benjamin Guggenheim, who served as bookkeeper for his father’s mining interests, and David May of May Department Stores. Other prominent Jews made a living selling goods and services to the miners including wholesale liquor and tobacco. Typical of other Western towns, Leadville’s citizens also enjoyed the “Wild Life.” At Hyman’s Club Room, known for the brawls that occurred there, John H. “Doc” Holliday had his last shooting - that of Billy Allen. Ben Loeb’s place became famous throughout Colorado as a saloon, variety theater, dance hall, and place to hire prostitutes. It even held boxing and wrestling matches. Religious activities were important, too. Leadville’s Jewish population was large enough to hold Rosh Hashanah services in the Shoenberg Opera House by 1879. In August 1884, Congregation Israel built a synagogue for $4,000 in 33 days on land donated by Horace Tabor. Rabbi Morris Sachs of Cincinnati, Ohio dedicated the building, on September 19, 1884. It was an event coinciding with that year’s Rosh Hashanah. Jewish and non Jewish organizations, such as the Knights of Pythias and the Ancient Order of United Workmen, benefited by the Jewish population’s presence. Many Jewish organizations were charitable in scope. A leading one was the Hebrew Ladies’ Benevolent Society. It had 40 members and gave assistance to families regardless of their religious denomination. A popular event was their annual Purim Ball. The Hebrew Benevolent Association of Leadville (established in 1879) buried the dead and cared for the sick and orphaned. In 1880, this association established the Hebrew Cemetery in Leadville’s Evergreen Cemetery’s southwest corner. Today it holds 132 graves identified as part of the pioneer era; one fourth of these were infants. The burial locations of 12 people have been lost and only 59 original markers remain in the cemetery. No rabbi ever lived in Leadville to conduct services. Instead, these were led by the congregation’s lay members. This led to some disagreement with the orthodox members splitting off in 1892 to form Kneseth Israel. The orthodox congregation met in members’ homes until 1893 when they purchased a former Presbyterian church. That building, at 119 West Fifth Street, has since been demolished. During this period, Temple Israel continued to hold services and cultural events such as concerts and balls. After the repeal of the Sherman Silver Act in 1893, many sought their fortunes elsewhere. Leadville’s Jewish population was largely depleted by World War I. The building was not always a temple. Between 1914 and 1937, it sat shuttered and unused. In 1937, the rear became a family residence for Steve Malin, who used the front as a radiator repair shop. During World War II, it was a dormitory for local miners. In 1955, the St. George Episcopal Church, across the street, acquired the building to use it as a vicarage. From 1966 to 2006, it housed rental apartments. In 1987, Bill Korn established the Temple Israel Foundation whose purpose is “to acquire, historically rehabilitate, and maintain” the Temple Israel building and to research Leadville’s Jewish history. In October 1992, the foundation purchased the temple and in 1993 obtained title to Leadville’s Hebrew Cemetery. Korn has replaced missing tombstones with flush stone markers and now holds an annual cemetery cleanup. Currently fewer than 100 Jews live in the town, none of whom are descendants of the original pioneers. Regular services are no longer held at the building. The synagogue is available for special events. For example, a wedding took place in the temple in 2012. 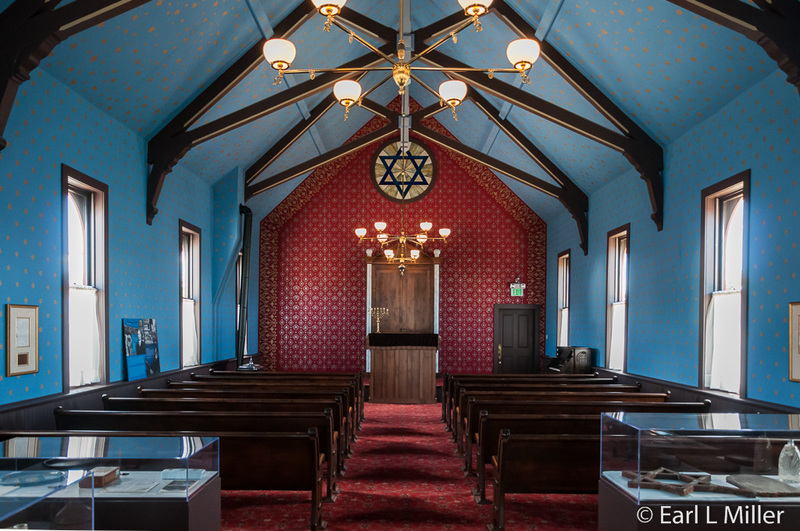 It also serves as a permanent museum documenting Leadville’s frontier Jewish history and synagogue. Display cases include a traditional Union prayer book, jugs of whiskey from merchants, and artifacts from Jewish businesses. You can visit the temple daily from mid May through mid October from 11:00 a.m. until 6:00 p.m. It’s located at 201 West 4th Street and the telephone number is (303) 709-7050. Camp Hale was named in honor of Colonel Irving Hale, Colorado’s first West Point graduate. From 1943-1946, Camp Hale served as a prisoner of war camp for German POWs.